I’ve been so excited to share this review with you all since I first tried this product. I discovered Pinks Boutique not so long ago whilst I was visiting Bournemouth to see the gorgeous London Grammar (100% recommend seeing them live by the way). Me and my Fiance stopped off in the hotel spa for a treatment before heading home, and I noticed the array of lovely Pinks Boutique products on the shelf and got sniffing. The beauty therapist said that she highly recommended them as they’re natural and organic; and have drastically improved the condition of her skin. As if I needed convincing! I got straight on the website and started browsing and was particularly taken by the sound of this facial polish. It is described as ‘a gentle facial scrub, promoting the natural regeneration of skin cells’ which sounded perfect to me. Scrubbing away all the dead skin cells and promoting the regeneration will help to maintain a healthy, radiant glow, so it is important to exfoliate regularly in order to keep your skin clear from impurities. 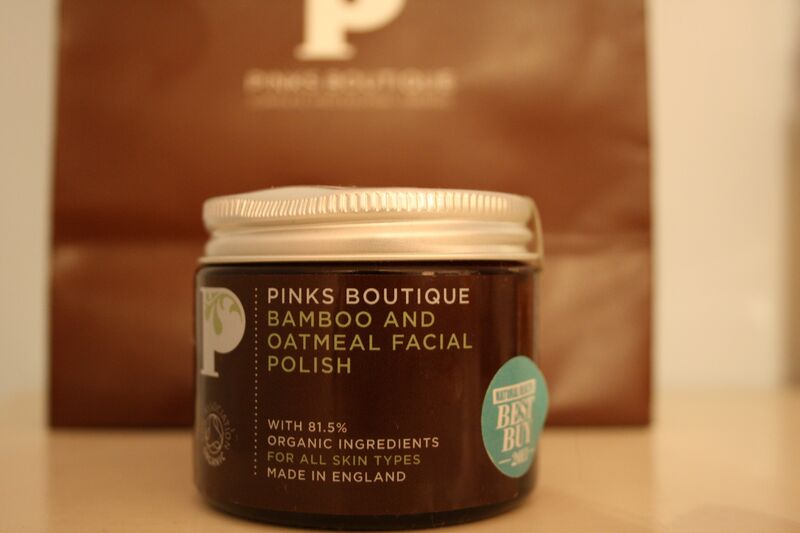 After we got tweeting, Pinks Boutique offered me a sample of the Facial Polish and the Lemongrass & Mandarin Cleanser – needless to say I was overjoyed! So, what do I think? Where do I even start? I really couldn’t wait to try this product, so as soon as I received it I rushed upstairs and slathered some on. It’s a very rich balm, which is almost a little creamy. 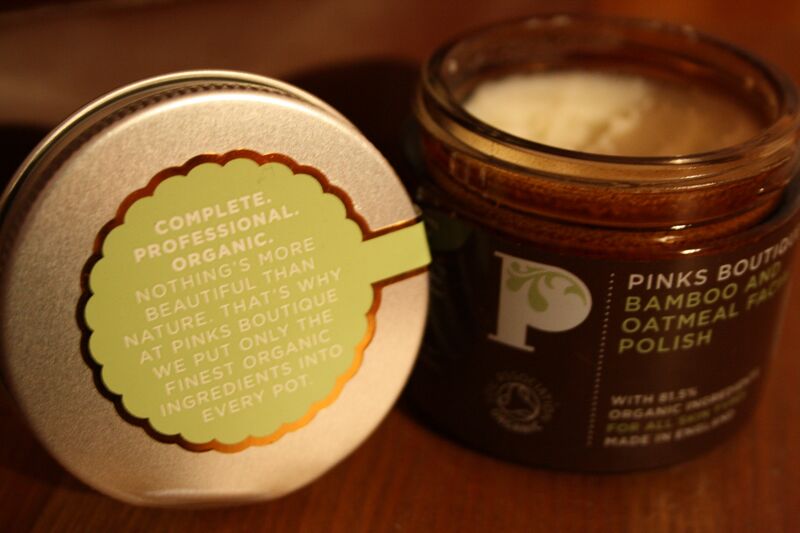 At first glance I was worried that it didn’t have any exfoliants in it, but once you start to rub it between your fingertips it becomes apparent that it’s just a very gentle exfoliator with very finely milled sustainably sourced bamboo and oatmeal. These ingredients really get to work and buff away any dirt or grime on your face, whilst the vitamin E enriched shea butter base nourishes and moisturises your skin to leave you with a wonderfully clear, bright and radiant complexion. To use, you simply extract a heaped 5p size blob from the jar, Pinks Boutique suggest that this is done with a spoon/spatula to avoid contamination, however there is not one supplied with the product. I recommend you look into their (super cute and amazing) selection online – you can pick up a gorgeous wooden mini spoon for only £1.80 – much better than the end of a chip shop fork eh? You then rub the product between your fingertips and ‘rain drop’ it onto you skin by fluttering your fingers over your face and then rub it in, concentrating on areas of visible congestion – the nose and chin for example. After this you simply wash off with a muslin cloth, or the Pinks Boutique mitts and hey presto – you look incredible! Impressed doesn’t quite cut it… I was amazed at the results! I genuinely could not believe how soft I was after using this product. I was softer than a baby, it was magical. This was just the ultimate reassurance that all of the grossness had been washed away, and I was left completely fresh faced. Although it’s hard, please do your best not to constantly stroke your face! This will produce excess oils and contaminate your lovely clean skin. The formula is also pro at reducing pore size, which is always an added bonus! Needless to say I 1000000% recommend this product! It is so luxurious and delivers exceptional results. The gorgeous scent almost transports you to a blissful state of calm, giving you the spa style experience you need right at home. I have also given the Lemongrass and Mandarin cleanser a go and I have to say that I feel really impressed by this too. It’s a wonderful everyday cleanser that is designed especially for oily or combination skin. It is designed to convince your sebaceous glands to calm the heck down and stop producing excess oils, which will help keep your pores clean as a whistle. There has been no tightness, no redness or irritation, just very gentle yet effective cleansing. It’s safe to say that I’ll be repurchasing this, hopefully along with some of their body range, too! Have you ever tried Pinks Boutique – what are your thoughts? Wow this looks fabulous! I’m pinning this to remind myself to buy this someday. Ah I was so tempted by that – always so great when you find a company with reasonably priced tester boxes!